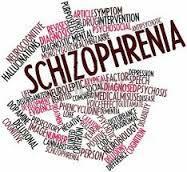 1 What is Catatonic Schizophrenia? In extreme cases, the individual may show symptoms like motor activity, which are considered peculiar or excessive. For example, a patient may mimic sounds something known as echolalis or mimic movements, also referred to as echopraxia. If a patient is showing motor activities like these, it is called catatonic excitement. Catatonia happens in some individuals who have schizophrenia and the symptoms may involve flipping between under-activity and hyperactivity. The risk factors for this condition may be same as those for generalized schizophrenia. A number of treatments exist for catatonic schizophrenia and a doctor will be able to identify the right treatment option to take. It is not known what causes catatonic schizophrenia, however, researchers hold the view that some forms of schizophrenia may be caused by brain dysfunction. However, it is not known why the dysfunction in brain occurs but it may be as a result of genetic as well as environmental triggers like stress. 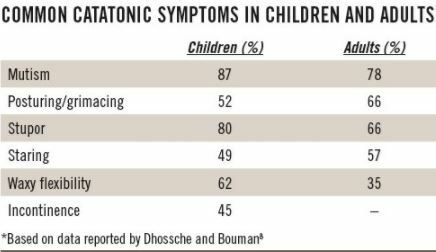 It is rare to find cases of catatonic schizophrenia, however, the catatonic states can be seen in some other forms of mental illnesses other than schizophrenia, for example in neurodevelopmental disorders, depressive disorders, and psychotic bipolar. A person being in a stupor. This means that the patient may not be responsive to their environment or they show little or no activity or movement. When they are moved, they will tend to maintain same position and may remain immobile, something known as waxy flexibility. An individual will engage in excessive movement without any purpose or cause. The patient may have the excessive movements with no reaction to something external. A person tends to resist any form of instruction or an attempt to move them. They may refuse or are unable to speak, something referred to as mutism. A patient with catatonic schizophrenia may take a bizarre or an inappropriate posture or stance, willingly. They may also show peculiar movements, mannerisms, and pronounced grimacing. An individual will senselessly repeat words that have been spoken to him or her, a condition known as echolalia. The patient may involuntarily imitate movements of other people, a condition known as echopraxia. The patient may have agitation with no known reason. Delusions– where the patient tends to believe that they are being persecuted. The patient may also think that they possess extraordinary gifts or powers. Hallucinations – the patient may be hearing voices, also known as auditory hallucination. However, the hallucinations may also include visual aspects where the patients sees things that are not there. There may be hallucinations that involve other sensory system. Avolition– this is lack of motivation and a patient may lose their drive and give up on their everyday activities, for example, cooking and washing. Thought disorder– you may find that a person is jumping from one subject in one moment and goes to another subject in the next moment when they speak. The speech of the person may be impossible to understand or it may be muddled. Social withdrawal– patients with schizophrenia who withdraw from social life may be thinking that someone is going to harm them. Poor expression of emotions– the patient may not respond to sad or happy events and at times, they may react inappropriately. Unaware of illness– this is also referred to as poor insight. Since the patients feels that the delusions and hallucinations are so real, they may not think or believe that they are ill.
Having cognitive difficulties– a patient may have inability to concentrate, plan ahead, remember things, and to organize themselves. Communication also becomes a problem. A doctor will look at the weight, height, heart rate, temperature, and blood pressure of the patient. The doctor may also listen to lungs and heart and examine the abdomen. A doctor may order for a CBC test to check for drugs and alcohol as well as thyroid function. This test is used to check the functioning of the brain. A patient will meet a psychiatrist who will ask questions about their thoughts, behaviors, and feelings. The psychiatrist will discuss the symptoms with the patient and will look at things like when they started, how they have affected the life of the individual, and how severe they have been. The psychiatrist will ask the patient if they have been having thoughts of harming themselves or feeling that other people may harm them. A patient may be given medications such as benzodiazepines, which act as tranquilizers. Benzodiazepines are fast acting and can be intravenously administered ( injected into a vein). However, there is a risk for the patient developing dependency on the drug if it is used for a long time. Other medications include barbiturates, which act as sedatives or depressants. Barbiturates help suppress the central nervous system and their effects may come with mild sedation or even total anesthesia. These medications can relieve the catatonic symptoms rapidly. Also, when used for extended period of time, they could lead to drug dependency. A doctor may also prescribe antidepressants as well as mood stabilizers. A patient that does not seem to respond to other forms of treatment like medications may need ECT. An electric current is usually sent through the patient’s brain to help produce controlled seizures or convulsions. In this treatment procedure, it may bring about short term effects such as memory loss. Although medications may help a patient with catatonic schizophrenia, psychotherapy may be required, but only if the symptoms are mild. In severe cases, psychotherapy may not be helpful. A patient may need to be hospitalized when they have severe cases of the condition. In the hospital, a patient will have access to better sleep, proper nutrition, and hygiene. A patient may need help to live independently. This is important during the recovery of the patient. Patients are taught how to communicate better, prepare nutritious food, and have good hygiene.